Beck Cottage in Croasdale, near Ennerdale Lake sleeps 6 people. 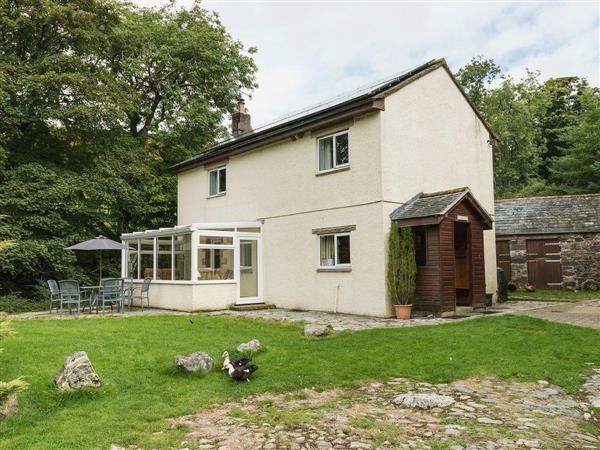 Detached riverside holiday cottage in the Lake District National Park, 1 mile from the lake in the uncommercialised Ennerdale Valley. The tiny hamlet is surrounded by spectacular countryside, perfect for red squirrel and birdwatching on site and ospreys and RSPB reserve within 12 miles. The fells rise above and the cottage - facing the sun - backs into a woodland by a stream, next to the owner’s farmhouse. Fishing and riding, 2 miles and Loweswater 6 miles. Adjacent to coast-to-coast walking and cycle routes. Shop and pub 2 miles. Ducks resident. Ground floor: Living/dining room. Kitchen. Conservatory. Shower room with toilet. First floor: 2 bedrooms: 1 double with additional single, 1 twin with additional single. Multi-fuel burner in living room included.First amount convector heaters and electric included, remainder by meter. Night Storage Heating and bed linen included. Cot. High-chair. Satellite TV. Electric cooker. Microwave. Shared laundry room with w/machine and t/dryer. Fridge/Freezer. Garden and furniture. Parking (2 cars). NB: There is a stream in the garden. Holidays at Beck Cottage run from Saturday to Saturday. Beck Cottage is in Cumbria; should you be on the lookout for a special offer, you can find all the special offers in Cumbria. It's always worth checking to see what is on offer at the moment. Do you want to holiday near Beck Cottage (986), you can see other cottages within 25 miles of Beck Cottage; have a look to find your perfect holiday location.